County commissioners and other local leaders are looking for ways to cope with the funding cuts in Gov. Tim Pawlenty's budget. The governor's spending plan calls for cuts in many programs to fill a $4.2 billion shortfall. As debate over the proposal heats up, some officials are questioning the long-term affects, especially in social programs. 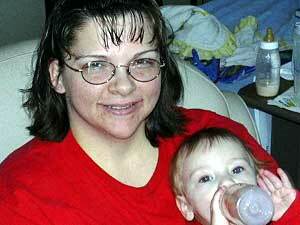 Moorhead, Minn. — Jennifer Boggan sits in a chair and feeds her 11-month old son, Andrew. But they're not at home in the kitchen, they're in a hospital room. Andrew is a smiling, active little guy. He's feeling much better now, after being hospitalized for a respiratory infection. Andrew's illness is just the latest incident in an eventful year. Boggan is a single mom, with four more kids at home. She moved back to Detroit Lakes last year to escape an abusive spouse. She had no education or job skills, and very little money. But things have changed. "There are people out there who are honestly trying to get their life back together, and I did," says Boggan. "If you look at everything I had on my goals list last year, I accomplished every single one. To get my G.E.D., to get a job, to get my own place, to get my schooling. I'm not just sitting at home collecting welfare." Boggan is quick to point out she's had help. She receives food stamps and Medical Assistance. The biggest help is a state program that provides free daycare. Each year the state spends millions to help low-income people improve their situations. But with a record deficit, spending for those programs will be cut. Boggan says if the free programs weren't available, she wouldn't be able to go to work, or go to school and become a registered nurse. "It usually takes two incomes (to raise a family). But I only have one, so I need a good-paying job. That's why I'm going to school -- to get a good job so I can take care of my kids," Boggan says. If you look at everything I had on my goals list last year, I accomplished every single one. To get my G.E.D., to get a job, to get my own place, to get my schooling. I'm not just sitting at home collecting welfare. But it's going to get a lot tougher for people to get that help. Qualifications for aid will get harder. Jennifer Boogan may have to pay for daycare, and fees for other programs that help low-income people will increase. Applicants for the state's welfare to work program won't get assistance until they pursue work for four months. Dennis Lien, director of the Clay County Social Service Center in Moorhead, says those changes could backfire. "Those people who could use that money to defray the costs and keep them continuing in employment, maybe will not be able to even be employed," says Lien. "And in many instances, the childcare funding is that key little piece of financial assistance that keeps that person working." Lien says if the economy continues to struggle, the need for services will grow but there will be less help available. That worries Clay County Commissioner Mike McCarthy. McCarthy, a former police officer, spent 15 years working with juveniles. He says less money for things like the Juvenile Placement Fund is inviting trouble. "It just doesn't make any sense long term. We're going to go in a cycle. We have seen crime go down because of all these preventive programs for the last 10 years. We're going to see it go back up again because that's gone," says McCarthy. "And then 10 years from now, we're going to say, 'My gosh, we need to do something about this. We need to get these kids in before they enter the system.'" McCarthy says Clay County will lose almost $5 million over the next three years -- 17 percent of the county's budget. He says the state mandates programs, but wants the county to pay for them. In Clay County, commissioners are preparing for the worst. They have told department heads to prepare three spending plans with cuts of 10, 20 and 25 percent. "And unfortunately, the way things are right now, the majority of that (budget cuts) is staff," says McCarthy. "We already have a bare-bones budget and we're making due with what we've got. And the further reduction is going to result in staff reduction, which will result in program reduction." Mike McCarthy isn't optimistic that the budget will change dramatically during the legislative process.